Today homeowners are focused on two criteria when buying a heating or cooling solution---higher efficiency and lower power bills and cooling comfort. The condensing furnaces offer both of these which say why they would see an increase in sale in near future given the fact they are a bit high-priced. 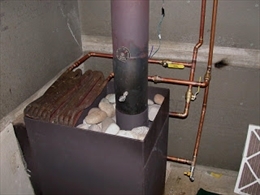 A condensing furnace works in the same way as that of a traditional furnace. The fuel burns, produces heat, and sends the heat to the heat exchanger. This heat is used to warm the air that will be circulated in the house. The by-product of the combustion which contains water vapour is then sent to the second heat exchanger where it is condensed and turned into a liquid. The process of condensation gives out heat which is used to warming the house. The resulting liquid is then drained out of your home through a PVC pipe. Condensing furnaces ae growing in popularity because of the comfort they can provide to their users. According to Bill Thayer Jr., co founder of Eagle Air Heating and Cooling in Liver more, California, the customers are not buying them only because they can save money. They are purchasing them as they are convinced that these will enhance comfort at home. But higher efficiency is also a key factor. According to Brian Schutt of Home sense Heating and Cooling, Indianapolis- these furnaces are particularly popular in colder regions of the country where winters are long. The more one requires using them, the more benefit you get from that increased efficiency. Customers are attracted by a quick payback period of condensing furnaces. The AFUE of a condensing furnace is 80%. It implies 80 percent of the energy dollar is converted to usable heating for the home. Old furnaces deliver around 65 to 70 percent AFUE. Geography plays big role in driving the sale. But the units are also popular in in Southern climates. According to the estimate of a dealer, almost half of his customers are opting for them. Generally people who spend long hours at home are choosing condensing furnaces. The furnaces run for longer time at higher efficiency and generate lower bills. In the last few years more than half of Lenox furnaces that were sold were condensing furnaces. The sale has also been driven by money saving tax credits. In addition to comfort and efficiency, quiet operation and advanced controls are attractive reasons to invest in condensing furnaces. These days systems come with remote access features. As a result condensing furnaces that offer their users to make system adjustments remotely are gaining popularity. These adjustments enable you to change settings to save energy. 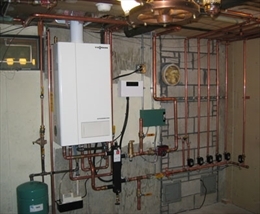 Many of condensing gas furnaces offers these controls as well as other features, such as a self-calibrating modulating gas valve, an efficient and quiet variable-speed airflow system, multiple continuous fan options, and an electronic control board with self-diagnostics. The condensing furnaces ae quipped with two-stage or variable-stage gas valves, which help to heat a home more smoothly and evenly for longer cycles. They are also integrated with multi- or variable-speed blower. However an obstacle that has been seen in the sale of condensing furnaces is its non-suitability in retrofit projects. You may need to change a steel B-vent flue to PVC [polyvinyl chloride], add a new pipe for combustion air, or use further plumbing components. These will make installation costly. Besides these there could be need for an interior sheet rock, roofing, or exterior wall modifications which would need hiring subcontractors. Sometimes making these modifications become quite complex, costly, and impossible. At such times creative solutions have to be adopted.